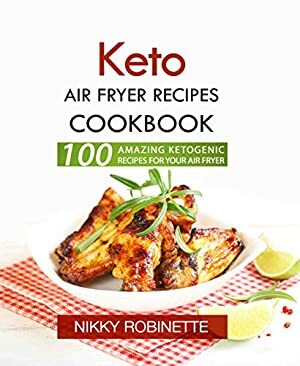 The Ultimate Air Fryer Cookbook For Making Fast And Delicious Keto Meals! Home cooking that tastes good and keeps you in ketosis does is easier than you think! Let bestselling author Nikky Robinette show you the way as she unleashes her passion for delicious, healthy low-carb recipes with the favorite appliance of the busy home cook: the air fryer. The Keto Air Fryer Recipes Cookbook is the easiest way for busy people to enjoy healthy low carb food at home in their air fryer that is 100% keto compliant. Air Fryer Basics with easy to follow instructions, tips, and tricks for using your air fryer! Maintaining a healthy ketogenic diet has never been easier, tastier, or more fun when you grab the Keto Air Fryer Recipes Cookbook, your go-to resource for making the ketogenic diet a successful and enjoyable experience using your air fryer! Log In to track Nikky Robinette on eReaderIQ. to be notified each time the price drops on any book by Nikky Robinette. to stop tracking Nikky Robinette. We started tracking this book on January 12, 2019. The price of this book has changed one time in the past 104 days. The current price of this book is $2.99 last checked 22 hours ago. We last verified the price of this book about 22 hours ago. At that time, the price was $2.99. This price is subject to change. The price displayed on the Amazon.com website at the time of purchase is the price you will pay for this book. Please confirm the price before making any purchases.